With this development an optimal form of an AC/DC transformer for well regulated DC voltage is achieved. Basically it works like this: The AC line is rectified and filtered to give an acceptable DC voltage. 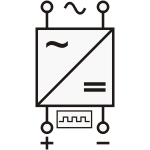 A pulse width modulated switch chops the DC voltage into a high frequency pulsed waveform which is then converted via a high frequency power transformer, to the required voltage. This is subsequently rectified and filtered. The control circuit senses this output voltage, compares it with a reference thereby determining the duty cycle of the switching circuit and, therefore, the amount of energy transfered from the primary to the secondary of the high frequency power transformer. By using this method, as compared to a linear type, the power supply is able to work with varying load demands without having to dissipate surplus heat.